Watch Pacquiao vs Algieri Live Streaming and Replay: The Pacquiao and Algieri Hungry for Glory fight is upcoming and if you want to watch the fight but you have no cable TV worry not because you can watch it anywhere, whether stuck in traffic or in LRT, you can watch the must see bout with your own gadget. 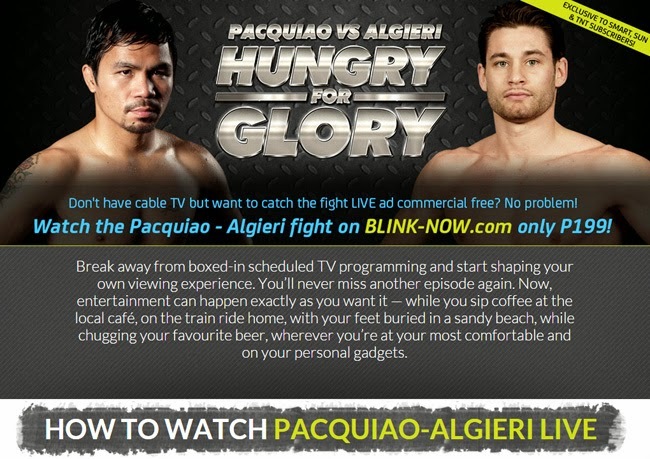 To watch the awaited fight of the Pinoy Boxing Icon and the Americans’ bet, download BLINK-NOW on Google Play or the AppStore on your smartphone or tablet. After downloading, you can locate your subscription under the MyBlink tab. It is so convenient you can stream it on your Mac or PC through a browser. You will only need a WiFi connection or a data network connection such as 3G or 4G. Be reminded that though you had purchased an E-Pin, mobile data charges may apply if you are going to use a data network service but not yet registered on a data plan. For 199 pesos you can watch the Pacquiao and Algieri fight on November 23, 2014 live and you can also see all of the undercard fights. VOD features include Pacquiao versus Brandon Rios (2013) and Pacquiao versus Timothy Bradley (2014). If you have more budget and you plan to stay at home, you can subscribe to Sky Cable or Pay Per View via text, email or phone call. Register hrough text: type in SKYBUY REG (space) SKYcable account (space) smart card numbers then send to 2331 for Globe, TM, ABS-CBN Mobile and Sun Cellular subscribers and 231 for Smart and Talk & Text subscribers. After successful registration through text, key in SKYBUY pacman sd for Standard Definition (SD) subscription or type SKYBUY pacman hd for High Definition (HD) subscription then send to 2331 for Globe, TM, ABS-CBN Mobile and Sun Cellular subscribers and 231 for Smart and Talk & Text subscribers. Registration will be until November 22 at midnight only. You can activate via online by filling in a form found in http://www.mysky.com.ph/pacquiao/ or you can call the Skycable hotline. The service will be billed to the owner of the account. If you are out with friends, you can watch it on the big screen in SM Cinema’s. you can purchase the ticket via their online or by going to SM and purchase ticket in the cinema. The ticket will cost 552 pesos each, but you will be able to watch the fight in the big screen as if you are in Macau yourself. No budget? No worries, you can watch it live stream on boxingchannel.tv which is now available to Android devices and iOS supported gadgets. All you have to do is have a WiFi connection, or a data network but the latter can be charge to your prepaid load or postpaid account if you are not yet subscribe to a data plan or promo. SEE RESULT: Manny Pacquiao vs Chris Algieri WBO Fight here.